Reinier Battenberg: Hi Kyeld, Surprised to see you’re still in Japan or maybe i’m not so surprised! Guess what: your flea markets sound great, but …… i’m interested is selling- not in buying. How do i join the selling crew? By the way: how’s your famdamily? Kai will graduate again, this time from UC, Davis. He’ll be here around new year’s. All the best! Nita: Hi… I will go to Japan 30sept-8oct this year.. do you have any suggestions which flea market I should go? Preferable near osaka. Thanks! Kjeld Duits: @Aniko Palko: One market in the Kanto Region that I have personally visited and can recommend if you don’t have time to check out many is Takahata Fudo “Gozareichi” Antique Fair. It is held on the 3rd Sunday each month from 7 a.m. to 4 p.m. The next fair will be on May 17th. 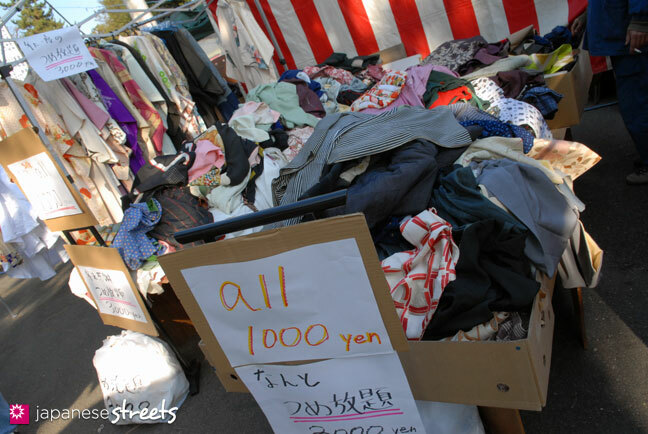 There are about 120 vendors, including several selling kimono. It is near Takahata Fudo Station on the Keio Line (Map). By train from Atsugi you need to change trains three times and it takes about 70 minutes, but it is worth the trip. Check the train schedule with JORUDAN. 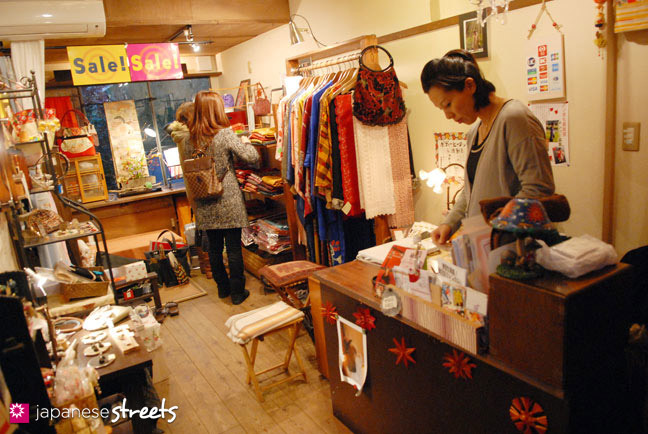 For other markets, I suggest you check this excellent list of antique markets in Kanto. Have fun! May 14 2010: We are all used to buying cloth and even space by the meter. But art by the meter? 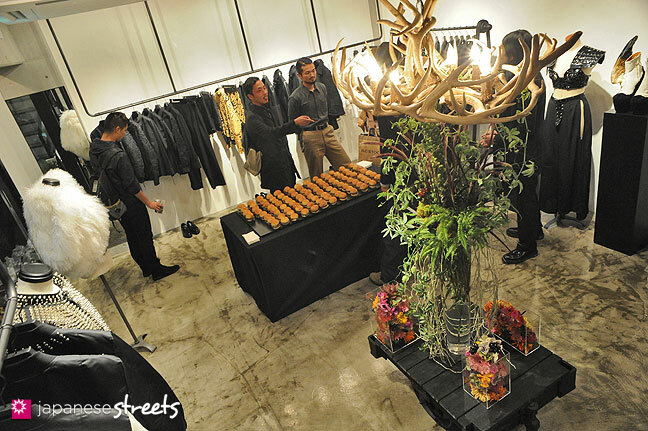 Tokyo based art gallery ART-Meter is making it a success. Guerilla Embroidery: What a fabulous idea! As a textile artist (and not Japanese) I couldn’t take advantage of this, but maybe us Europeans will pick up the idea soon. Kjeld Duits: I guess that non-flat art, like pottery and sculptures, could potentially be sold by volume, priced 10 by 10 by 10 centimeters. Feb 14 2010: Japan is famous for its camera makers, but there is no other camera maker like Tokyo based PowerShovel. Kjeld Duits: Hi Tom, if you are looking for Sony cybershot quality, these cameras don’t measure up. 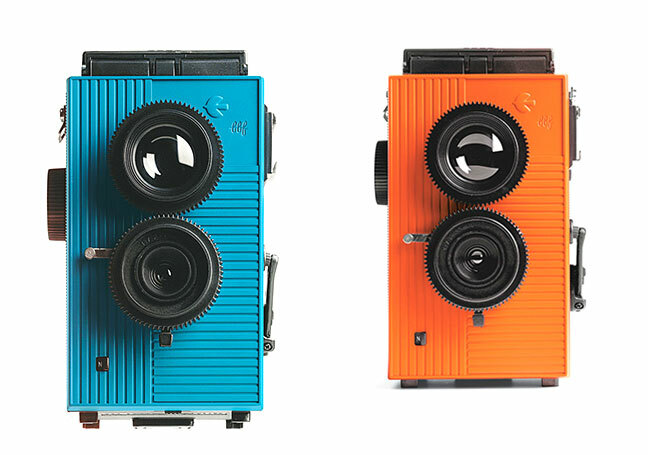 But if you just want to have fun with an unpredictable toy camera, than these are game. Toy cameras are about fun and unpredictability. And PowerShovel cameras also offer cool design. The wooden camera in Myanmar you mentioned enthralls me! Dec 25 2009: Antique kimono have become popular and it is now difficult to find nice ones at a good price. At Osaka’s Mei you’ll always find an excellent selection. Kjeld Duits: Good question, Sandy. We have no contributors (yet) in Okinawa, and I haven’t been there for ages. So I don’t know. But I assume there must be used kimono shops there as well. Would love to hear from other readers! sandy: Are there similar shops on okinawa or ishigaki? 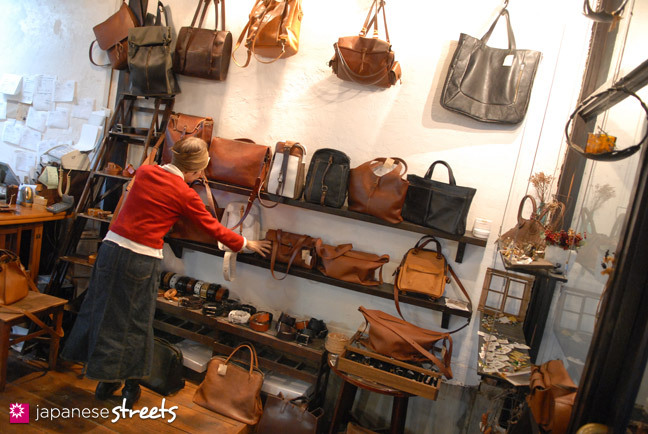 Dec 18 2009: “We only use leather with character for our bags,” says bag creator Mitsuko Fujiwara.